Jesus’ earthly ministry was undeniably blessed by the Holy Spirit, being clearly seen in His birth (Matt 1:18, 20), to His appearance at Jesus’ baptism (Matt 3:16), to being the One who was granting Him the power to work miracles before the people (Matt 12:28). It is Jesus’ earthly life that sets forth the model for what it is for one to walk in the Spirit, abiding in the Father (John14:10b), with the intimate fellowship-relationship with the Father being cultivated through obedience to His commandments (John 14:21). 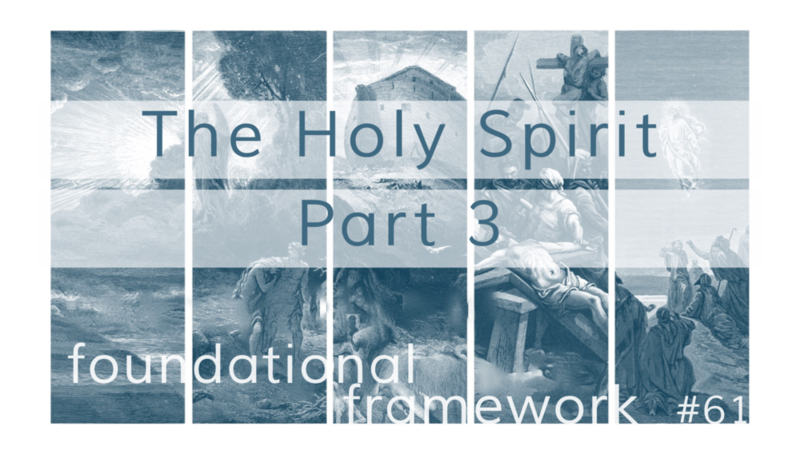 In what is commonly known as the Upper Room Discourse, we find five mentions of the Holy Spirit in Jesus’ teaching which provides clarity about His Person and ministry. John 14:16-18. Chapters 13-16 and Jesus’ prayer in chapter 17 serve in preparing His disciples for His betrayal, arrest, and crucifixion. Having commissioned them with a “new commandment” that called them to “love one another even as I have loved you” (John 13:34), Jesus then exhorted His disciples to “believe” in Him. We should not take this to mean that they needed to be saved so that they would go to heaven when they died, but that they needed to keep their confidence in who He is as the Messiah of God (Matt 16:16). With the events that would soon transpire, this was not the time for unbelief! His oneness with the Father is one aspect that is put forward to ground them in right thinking (John 14:7-11), but even if this wasn’t something that they had convincingly understood, at least His works testified to His Person as the Christ (John 14:11), which are actually the works of the Father (John 16:10b), which were also the evidence of the power of the Holy Spirit (Matt 12:28). In v.16, Jesus turns the conversation to the importance of the Holy Spirit, Who would be sent because the Son will ask the Father to do so (John 14:16a). The Spirit is presented to the disciples as “another Helper,” seeing that Jesus would qualify as the first “Helper.” It is with this particular word that our greatest understanding of the role of the Holy Spirit takes place. The various English translations have sought to capture all that this word encompasses: “Helper”- NASB95, ESV, NKJV, “Counselor”- HCSB, NIV84, CSB, “Advocate”- NET, NLT, NRSV, and “Comforter”- KJV, ASV, Darby, Young’s. Regarding the secular usage, Derickson and Radmacher write, “As a legal term it referred more to the friend who goes to court with the defendant than to a professional advisor or attorney.” Such analytical information paints the picture of an inseparable relationship that is God Himself, standing beside the believer at all times (all the while residing in the believer at the moment of faith starting in Acts 2), aiding, guiding, consoling, and uplifting, just as Christ did when He was physically present with His disciples. The idea that Jesus conveys as “another Helper” shows that the Spirit will be much like Himself, yet closer, and according to the end of verse 16, eternally present with the believer always. This pertinent point must not go unnoticed. The Holy Spirit is ALWAYS with the believer in Christ. Never is he or she without help, comfort, guidance, or care. We are never alone! He is always present, active, and available. At the time that this was spoken this was not the present reality, but it is something that is a reality now. Turning to John 7:37-39 helps in understanding this. John 7:37-39. It seems odd that Jesus would suddenly stand up in the middle of a meal and begin yelling out profound and lofty statements, which could have very well been perceived as narcissistic utterances by the mass of people. However, the details of v. 37 unfold the significance of this action. Hart writes, “According to the Talmud, (Sukk 4.9), each day during the Feast of Booths… a priest would carry water from the spring-fed Pool of Siloam to the temple and pour it out on the altar in expectation of the coming Messiah.” Being the last day of the Feast of Booths, Jesus used the symbolism of the priest’s actions to proclaim Himself as the long-awaited Messiah, the very Giver of Life. In v.38 Jesus clarifies the metaphor of what He means by coming to Him to “drink,” stating that it is the one who “believes” in Him. The result of belief would be “living water” that would flow out from the innermost part of the person. The imagery is simple but profound. Not only was Jesus speaking of being the Messiah of Israel and the Giver of Life, but He is also speaking of something that is satisfying, quelling all wants or needs, being abundant in quantity and quality. One of the things that is extremely helpful in the Gospel of John is that John will occasionally provide a verse or two of commentary in order to clarify Jesus’ comments. This is a blessing to us as readers because John’s comments were recorded, as with all Scripture, under the inspiration of the Holy Spirit, so we know that his remarks are in perfect alignment to provide us with better understanding. In v.39, John tells us that the “living water” that will flow out from the one who believes is in reference to the Holy Spirit “whom those who believed in Him were to receive,” indicating a future tense “receiving,” speaking to the definite indwelling of the Spirit that would take place at Pentecost in Acts 2. Finishing out the verse, we also learn why this glorious privilege had not been bestowed upon believers during Jesus’ earthly ministry. John writes, “for the Spirit was not yet given, because Jesus was not yet glorified” (7:39b). The Lord’s timetable is precise. Jesus must first be glorified, which according to John’s Gospel, seems to be in relation to His death and the results of it for God’s glory (John 12:16, 23, 28; 13:31, 32; 17:1, 5; & 21:19- concerning Peter). This corresponds remained perfectly with the arrival of the Holy Spirit occurring after Jesus’ death, resurrection, and ascension. Moving back to John 14:16-17, Jesus refers to the Holy Spirit as “the Spirit of Truth” (John 14:17a), and then makes the comment that the world cannot receive Him because it does not “see” nor “know” Him (14:17b). This statement resonates with Paul’s words in 1 Corinthians 2:14, stating that the “natural man does not accept the things of the Spirit of God, for they are foolishness to him; and he cannot understand them, because they are spiritually appraised.” Those who are dead, being separated from a relationship with the Creator, cannot see, know, or receive the things of the Spirit. The very idea of the Spirit of God is considered a foreign intrusion into a methodically-designed, God-hating world system. Our present age operates by a mindset that all exists within the natural and physical realm, esteeming this is all that there is, and rejecting any notion of a greater reality in that of the supernatural. This is often labeled as “naturalism.” The Spirit of God is quickly labeled as an apparition of the “delusional religious fanatic” so that He can promptly be dismissed from being a legitimate entity with which the world must contend. The natural man would not dare entertain the idea that He is God. The advantage of the disciples is that the Spirit has been “abiding” with them, and Jesus quickly notes that the Spirit “will be” in them referring to the Pentecost event, just as we saw as referenced in John 7:39a. The word “abide” is a favorite of Jesus and John, as recorded by the latter, being used throughout his Gospel and Epistles (John 3:36; 5:38; 6:56; 15:4, 5, 6, 7, 9, 10; 1 John 2:6, 10, 14, 27, 28; 3:6, 9, 14, 15, 17, 24; 4:12, 13, 15, 16; 2 John 2, 9). This is the Greek word menō, which means to “remain, stay…” being understood as “a person or thing remains where he, she, or it is.” So the Spirit has with the disciples, but a greater assimilation will occur when He resides “in” them. Jesus finishes this section reassuring these men that He will not leave them without guidance, described by the term “orphans” in the NASB (John 14:18). Other translations use “comfortless” (KJV, AV) and “desolate” (RSV). It is clear by this point that Jesus is leaving them, yet He is not leaving them in the sense that they will be without His presence, guidance, and care. The emphasis is still upon the Spirit being “another Helper,” which will replace Jesus in a physical sense, but will only enhance Jesus’ message and ministry to them in another sense. This is a profound paradox, but one that every believer should find comforting with sufficient grounds to elicit praise! Our Savior is always taking care of us in extraordinary ways whether acknowledged by us or not. John 14:26. Two things are obvious from considering Jesus’ words to His disciples in John 14:19-25. First, obedience to Jesus’ commands are a demonstration of our love for the Savior. This is a countercultural message in the world today. We hear of “free love” and that “we should love everyone,” and even the Beatles pressed the issue, stating that “love is all you need.” Yet, Jesus explains that for one who is in a relationship with Him to actually embrace His words in such a way as to where their life is transformed, their choices are different, and their thinking has been altered, is to demonstrate love for the Lord Jesus Christ. While the Savior freely loves us (Gal 2:20), this love is demonstrated by the selfless sacrifice seen chiefly in the giving of Himself to redeem sinners. This is truly a “greater love” (John 15:13). Jesus tells His disciples plainly what it is to love Him (John 14:15, 21 [x2], 23, 24, 28). Here we find the second observation, with John 14:21 and 23 showing that a love for the Savior by keeping the commandments leads to a greater intimacy with the Father. Jesus states that the one who obeys Him is the one who “loves” Him, and the one who loves Him is loved by the Father, to which Jesus will then love with the expressed end being that He will “disclose” Himself to them (John 14:21). Jesus “disclosing” Himself to the obedient saint is emphanizō meaning “to cause something to be fully known by revealing clearly and in some detail—‘to make known, to make plain, to reveal, to bring to the light, to disclose, revelation.’” The footnote that accompanies this definition gives even greater clarity about what transpires when love for the Savior has motivated one’s obedience. It states that “all of these meanings involve a shift from the sensory domain of seeing, causing to see, or giving light to, to the cognitive domain of making something fully known, evident, and clear.” Plainly put, obedience leads to a greater intimacy with the Father and the Son (See also Col 1:9-10). Jesus’ teachings on what it is to love the Savior, and the guaranteed growth in one’s intimacy with the Father and Son, are what surround His referencing the “Helper” again in John 14:26. Here, Jesus again qualifies what He had previously stated in v.16-17: that the “Helper” is the Holy Spirit, and that the Father will send Him. The remark is also made that the Spirit would come “in My name” (John 14:26b), which harkens back to the “another Helper” designation (John 14:16b). At this point, Jesus reveals two additional details about the capability of the Holy Spirit in the life of the believer. First, the Spirit will “teach you all things” (John 14:26b). “All things” speaks solely to God’s truth. The Spirit, being perfectly God, cannot teach the believer that which is not true. No, He is “the Spirit of truth” (John 14:17a) and all that He affirms corresponds perfectly with who He is without contradiction. What we understand about God in general, concerning His impeccable character and His divine attributes, are all positioned upon the fact that He IS truth. Therefore, He defines what truth is because only He is true. One cannot forget that the Holy Spirit is perfectly God, therefore all that is true of God is equally true of the Holy Spirit. The second detail revealed is that the Spirit will bring to remembrance all of the things that were said to them by Jesus. No doubt that Jesus taught His disciples many wonderous things (John 21:25), both in word and in deed. The Spirit would be necessary to bring about the proper truth at the proper time for the opportunity of maximum obedience for their lives. This would speak to His present ministry of illumination in the disciples’ (and in the believer’s) life. With a command like “go and make disciples of all nations, baptizing them in the name of the Father and the Son and the Holy Spirit, teaching them to observe all that I commanded you” (Matt 28:18-19a), the Spirit would be necessary in relating this wealth of information as disciples were being made. The Spirit bringing about remembrance would also be necessary in the documentation of the Scriptures, which found men being “carried along” by the Spirit of God (2 Pet 1:21). The Spirit’s ministry of remembrance is why we have the Old and New Testaments today. Finally, many men of God have been called upon to witness in various situations (whether threatening or not), and to testify of Christ Jesus with their lives hanging in the balance. Even Jesus told His disciples “when they arrest you and hand you over, don’t worry beforehand what you will say. On the contrary, whatever is given to you in that hour—say it. For it isn’t you speaking, but the Holy Spirit” (Mark 13:11). There will be times in our lives when the conversation will turn to spiritual matters, and no doubt there will be many who will quickly speak emphatically about things that they are truly ignorant of because they do not know God. These opportunities find the Spirit giving us boldness, love, tact, and the words that are necessary to provide sound reasoning from God’s Word to an otherwise fruitless conversation. The Spirit will bring forth passage after passage and verse after verse, showing the truth of God’s Word to be undeniable and irrefutable. The Holy Spirit is truly a remarkable blessing from our glorious Father. His mercy in sending the Spirit to us for our help, comfort, and aid continues eternity’s theme of a gracious Sovereign who desires for His children to be well-kept in Divine arms. Packer describes this beautiful gesture, writing, “we can only appreciate all that our Lord meant when He spoke of ‘another Comforter’ as we look back over all that He Himself had done in the way of love, and care, and patient instruction, and provision for the disciple’s well-being, during His own three years of personal ministry to them. He will care for you, Christ was saying in effect, in the way that I have cared for you. Truly a remarkable person!” Such grace deserves our greatest praise! Thayer, Greek-English Lexicon, p. 483. R. A. Torrey, The Fundamentals: A Testimony to the Truth, vol. 2 (Bellingham, WA: Logos Bible Software, 2005), p. 332. Gary Derickson and Earl Radmacher, The Disciplemaker: What Matters Most to Jesus (Salem, OR: Charis Press, 2001), p. 123. John F. Hart, The Moody Bible Commentary (Chicago: Moody Publishers, 2014), p. 1629. Louw and Nida, p. 337–338. Ibid., p. 338, footnote 9. J.I. Packer, Knowing God (Downers Grove, Illinois: InterVarsity Press, 1979), p. 58.